Scottish National Party (SNP) leader Nicola Sturgeon has dropped her deal-breaker demand for Labour to scrap Britain’s nuclear weapons system, saying the party would support a Labour government on a case-by-case basis. 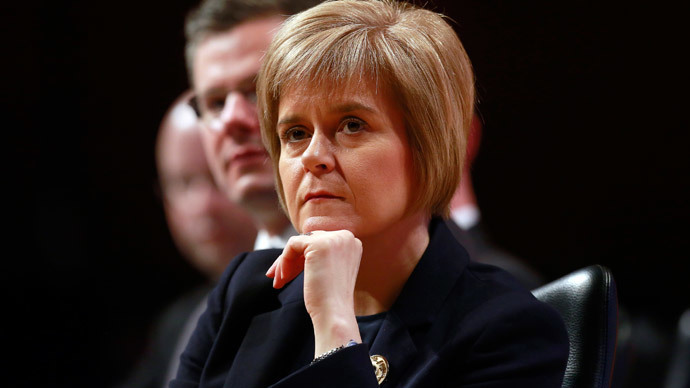 Scotland’s First Minister reversed an ultimatum made last December stipulating Labour must end its support for renewing the controversial Trident nuclear weapons system in order to gain support from the SNP. The concession follows a pre-election opinion poll by Lord Ashcroft that found Labour is set to lose almost all of its seats in Scotland in the general election this May. Sturgeon’s U-turn also comes as Green Party MP Caroline Lucas is due to call for a “progressive alliance” with the SNP and Welsh nationalist party Plaid Cymru at a Liverpool conference this weekend. In an interview with the Guardian, the SNP leader said her party could support Labour on a case-by-case basis without an agreement on Trident. Sturgeon previously ruled out supporting the Labour Party unless they agreed to “hard conditions,” such as scrapping their support for renewing Britain’s nuclear weapons program. Her turnaround demonstrates how seriously the SNP are taking the possibility of propping up a Labour government following the general election. “It’s more likely to be an arrangement where we would support Labour on an issue-by-issue basis,” she told the Guardian. When asked if that meant the SNP could back Labour policies without the party guaranteeing it would scrap Trident, Sturgeon evaded the question. “But we would not in any vote support the renewal of Trident and I can’t make that any clearer than I have already made it,” she replied. SNP supporters ardently opposed to nuclear weapons may take comfort in a recent survey by Campaign for Nuclear Disarmament (CND), which found 75 percent of Labour candidates standing in the general election are against renewing Trident. A poll published by Lord Ashcroft this week indicates Labour will be almost entirely wiped out in its traditional Scottish heartlands, as the SNP are set to win 56 out of 59 constituencies. Even former Prime Minister Gordon Brown is likely to lose his seat, despite winning by a majority of 23,000 in the 2010 election. With Labour facing a future without its traditional stronghold, a pact with the SNP may be the only way for the party to run a minority government. Former Conservative Prime Minister John Major attacked Miliband for not ruling out an agreement with Sturgeon, claiming a Labour-SNP coalition would be harmful to the UK. Critics of a Labour-SNP deal will find fuel in an upcoming announcement by Green Party MP Caroline Lucas. Lucas will call for a “progressive alliance” with the SNP and Plaid Cymru in a Liverpool conference this weekend. The three left-leaning parties could act as a bloc in the next Parliament, Lucas told the Guardian. If such an alliance takes form, it will prompt speculation as to how much influence the small parties will have over a future Labour government.